This McQuown Scholars weekend was packed with hands-on observation with Stone Edge Observatory, faculty and staff presentations, and the exploration of Yerkes Observatory, a central hub of discovery that functions as a crossroad between modern research in astrophysics juxtaposed with its historical value as an institution. This weekend spoke specifically to the goals of the McQuown Scholars program in engaging middle-high school students interested in STEM. These impressive groups of kids from Wyoming and Chicago dove right into the science of taking images, image processing, and observing asteroids, among other activities, with impressive curiosity and intellectual acuity. 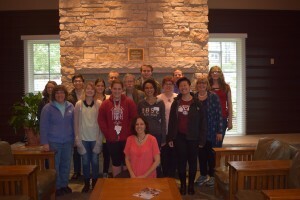 Not only were the faculty and staff teaching the students, but the students were teaching the faculty and staff, describing projects that they presented at the AAS meeting on variable stars and asteroids. Some highlights of this weekend included forming projects together that students could get involved in (e.g. asteroids, image processing), staying up into the wee hours of the morning observing and working in teams on the aforementioned projects, and making our own celestial spheres. But mainly getting to know these talented young researchers and seeing their participation in STEM was a pleasure! Students and educators huddled together around the Yerkes Observatory Library room table, with all eyes on the projector as a student live-observed M57 with Stone Edge Observatory’s (SEO) 0.5-m telescope in Sonoma. This hands-on SEO workshop, which garnered 15 people, brought together students and educators alike, to both marvel at and analyze the astronomical phenomena of our universe. Participants learned how to observe galaxies, nebulae, and transient objects, as well as how to process the data obtained. The workshop featured a mix of both formal and informal education, providing an environment of directional as well as collaborative learning. Highlights included observing asteroids, making color images, and brainstorming future projects, ranging from upgrading the GUI to creating a functioning pipeline to observing asteroids and variable stars. Participants walked away with a sense for potential astronomy projects to integrate into a classroom setting as well as into their independent time, while SEO gained valuable astronomers who aim to enrich the astronomy community as well as their own understanding of our universe.